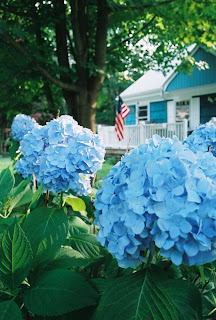 Every year, I fall in love with those beautiful blue hydrangeas at the front of my yard. As summer begins, I see the green shoots of hydrangea elegance peaking out of last years faded stalks. We just have this summer to enjoy and then we will me moving on. Can I have one order of West Coast and a side of palm trees and eucalyptus, please? I will miss seeing those amazing floppy heads of ocean blue take on a mossy tinge of green by summers end. These brief, glorious reminders of our time here on the country road, will remind me that we must enjoy and cherish people and things while we've got them. For Memorial Day, I remember those who have sacrificed so that I can cherish every season and fall in love every summer.